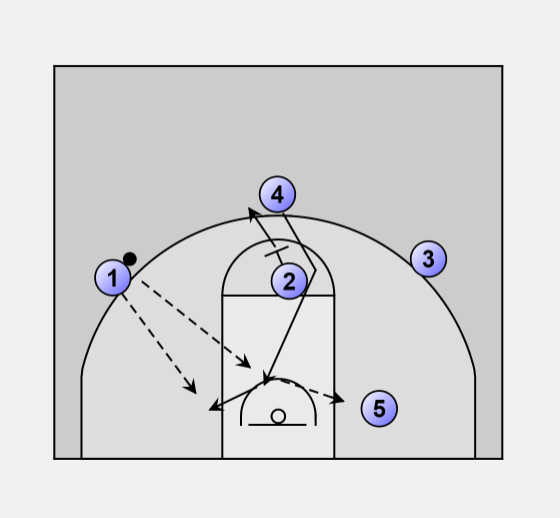 This play off the 30 series (or curl series) is a wing pass option with a back door cut by the point and a curl cut by the wing. The play will be reset so that it can be run to the other side or another play in the series can be called. This example will show the pass to (3). (4) will move to the free throw line, using a screen from (5), or any other method available. (1) will pass to a wing, in this case (3). This tells the offense to which wing the play is being run. 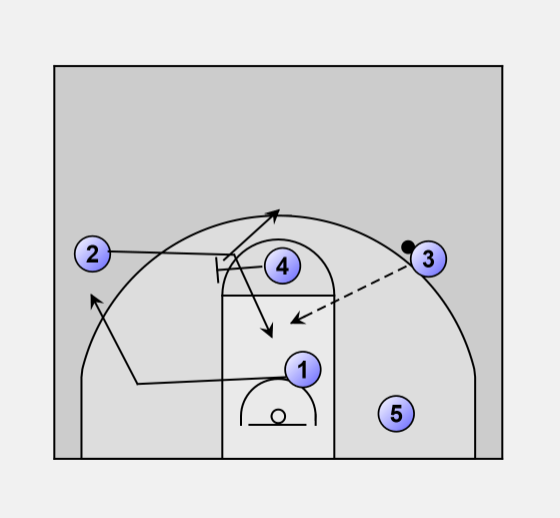 (4) will set a back screen for (1) who will cut to the basket. (3) will hit (1) on the cut. (1) can shoot, or if (5)'s man steps in, should have a pass to (5) for a layup. (3) can also pass to (5) for a shot. 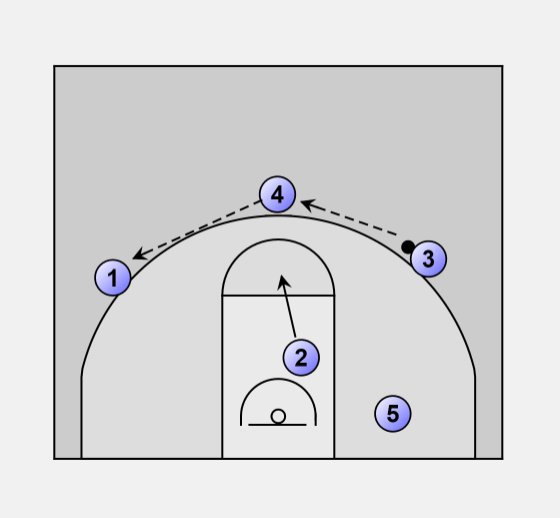 After setting the screen for (1), (4) will set a screen for (2) who will curl to the basket. (3) will pass to (2) on the curl. If (5) has the ball in the short corner, he can also look for a pass to (2) curling. (1) will go to the wing to replace (2). (4) will move to the point after the screen. If nothing was open, the ball will be reversed to (4) and then to (1). (2) will come to the free throw line. 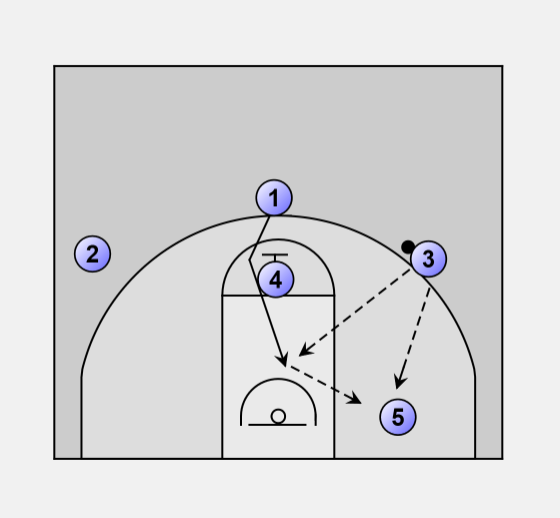 (2) will set a back screen for (4) who will cut to the basket. (1) will attempt to hit (4). (4) can shoot, or if (5)'s man steps in, pass to (5). If nothing is open, (4) will move to the ball side block for position. If (4) is not open, he will set a cross screen for (5). (1) will look for (5) on the block. (4) will clear to the other side. If nothing is open, (1) will pass to (2) at the point. The play is now ready to be run again to the other side or another play in the 30 series can be called.